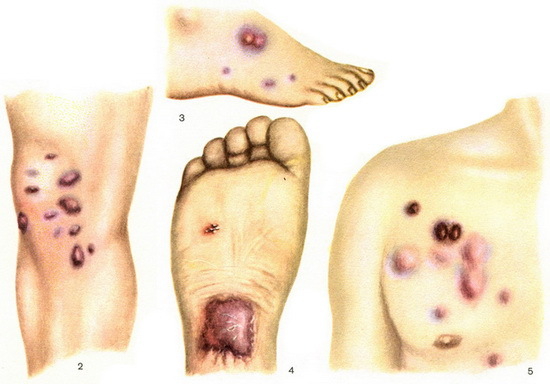 Sarcoma hemorrhagic idiopathic (KS) is a rare tumor of the skin of unknown etiology. Most authors think that the disease belongs to the group of retikuleze. Often affects the elderly. Clinically find less isolated, often multiple nodules and plaques, sometimes diffuse infiltrates bluish-brown elastic or dense consistence, in rare cases izyaslavs. The most frequent localization - Shin; the disease usually begins with a foot skin, sometimes amazed upper extremities, and rarely torso and other areas of the skin. Can affect internal organs, resulting in systemic diseases. Fig. 2 - 4. Elements skin changes in patients with idiopathic multiple hemorrhagic sarcoma. Fig. 5. Sarcomatous skin. The diagnosis is based on clinical and histological data. Sometimes you have to differentiate true sarcoma. The forecast is serious; the disease progresses, death occurs in various terms - from 2 to 20 years, often from bleeding from a decaying tumors of the gastrointestinal tract and lungs, cachexia, intercurrent diseases; known rare cases of spontaneous healing. Treatment - radiotherapy, long appointment arsenic preparations. The use of corticosteroid drugs impractical, antibiotics, usually ineffective. According to the latest data obtained satisfactory results of treatment of sarcoma hemorrhagic idiopathic new domestic cytostatic drugs - fosfatida and especially prospidine.